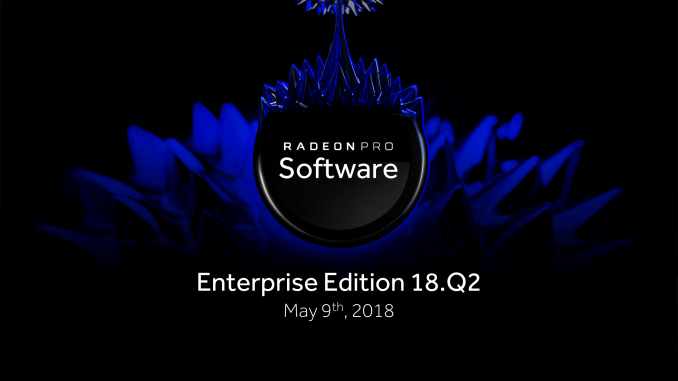 Not long after Windows 10’s first semi-annual major update of the year, AMD today has released Radeon Pro Software Enterprise Edition 18.Q2 WHQL, bringing full support for the April 2018 Update. A more mundane quarterly enterprise release, 18.Q2 includes the usual bug fixes, performance optimizations for professional applications, and updates for VDI & graphics virtualization. Additionally, 18.Q2 is rolling out alongside updates to ProRender and its plugins. 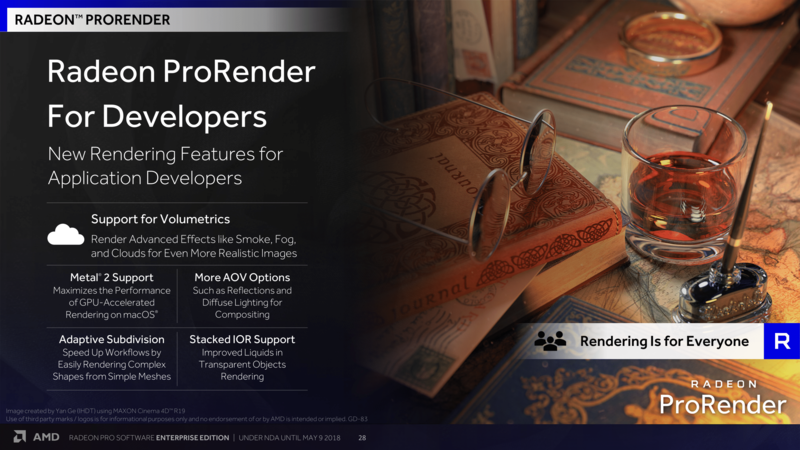 Overall, AMD has added a number of new developer rendering features to ProRender, including lighting and scenery effects. And introduced last month, macOS versions of ProRender Blender and Autodesk Maya plugins include support for macOS High Sierra 10.13.3 and higher using Metal 2; eGPU devices require 10.13.4. In other words, GPU acceleration can take more advantage of Apple’s own low-level API, Metal 2. Specific details can be found on the respective release notes for Radeon ProRender for 3ds Max v2.2, Radeon ProRender for Maya v2.3, and Radeon ProRender for Blender v1.6. 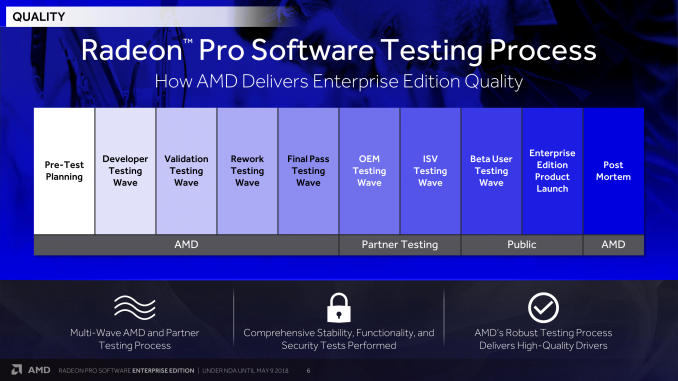 More so than the usual amount, AMD also stressed their enterprise driver testing process and some of the results gained from it, citing 2017 data. Given that AMD only started rolling out their new enterprise drivers in October 2016, the company is now able to look at a full year’s worth of feedback and issue reports. 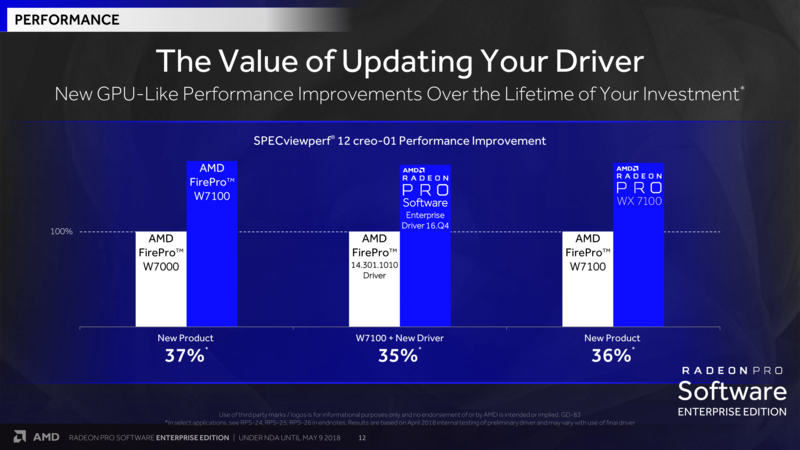 Meanwhile, for performance improvements, AMD is citing year-over-year uplifts in professional application performance compared to 17.Q2, with around 12% to 47% increases as tested using SPECapc and SPECviewperf. For Dassault Systèmes CATIA specifically, AMD saw 38% to 100% speedups in model benchmarks. In a more general sense, these uplifts can compound over time and lend older products like the AMD FirePro W7100 a new lease on life. AMD is presenting this data like so: updating a FirePro-era driver to a Radeon Pro Enterprise era driver on the Tonga-based W7100 (Radeon R9 285) increases performance to the same degree that upgrading to the Polaris-based Radeon Pro WX7100 (RX 480) will, and also to the same degree if you had upgraded the Pitcairn-based W7000 (Radeon HD 7870 GHz Ed.) to the W7100. Moving on to AMD’s MxGPU, their hardware-based SR-IOV virtualized graphics solution, 18.Q2 is coupled with the February production-level host driver for Citrix XenServer MxGPU, while XenDesktop and XenApp guest drivers have been updated with 18.Q2 binaries for cloud-deployed 64-bit Windows 10 and 7 platforms. 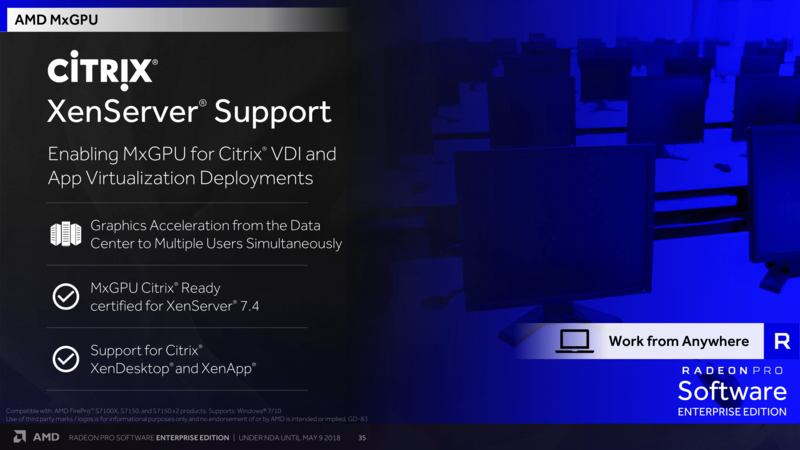 The packages and compatibility notes can be found on AMD’s Citrix Pro Driver page. Similarly, VMware vSphere ESXi 6.5 guest drivers for MxGPU and passthrough have been updated with 18.Q2 binaries for cloud-deployed 64-bit Windows 10 and 7 platforms. Meanwhile, their Guest Interface Manager (GIM) open source KVM host OS driver remains available on GitHub as a technical preview and the guest drivers have not been updated since Adrenalin Pro 17.12.2. Radeon Pro Overlay may not appear during clone mode with 2 displays. Display issues may appear when creating full screen 3x2 AMD Eyefinity Pro display configuration. AMD notes that Multi-GPU Eyefinity Pro on Windows 10 is not currently supported on any hardware for 18.Q2. [April 2018 Update] User may encounter issues with auto and passive Stereo with Windows 10 April 2018 Update. [Pro Application] Display issues may be observed while running Nuke benchmark on AMD FirePro W8100 and AMD FirePro W9100. [Pro Application] Intermittent display difficulties with certain models in Siemens Femap with Radeon Pro WX9100. [Pro Application] User may encounter display difficulties with geometry shader in MAXON Cinema4D. [Pro Application] Minor corruption may be seen on model with anti-aliasing modes in Dassault Systèmes ICEMSurf. [VDI] VM may disconnect when upgrading the driver and unable to connect until reboot. [VDI] The energy subtest of SPECviewperf 12.1.1 may not complete in an MxGPU environment. System may experience hangs on Windows 7 mobile platforms after driver installation with Radeon Pro WX 7100. Note that certified Radeon Pro drivers for ISV applications can be found on AMD's website. Due to Maya-MtoA software issue “Trac #3142,” some Viewport Draw modes for stand-ins draw an infinite line. Workaround is to toggle the Viewport Draw Mode of the stand-in in the Attribute Editor. Autodesk Maya 2017/2018 may show gray patch in playback in certain models due to Maya issue “Maya 41945.” Workaround is to click on a different frame on timeline or to click on first frame. For Linux support, details can be found in the release notes for Radeon Pro Software Enterprise Edition 18.Q2 for Linux. The Radeon Pro SSG is not supported with 18.Q2 for Linux, and the 18.Q2 for Linux has a table showing the appropriate driver for the listed Linux distributions. Note that for RHEL 7.5 and Ubuntu 18.04, AMD has also released Radeon Pro Software Adrenalin Edition 18.5.1 for Linux Early Preview. The updated drivers for AMD’s professional workstation GPUs are available online at the AMD’s professional graphics driver download page. Driver hotswapping ("Driver Options") is not available with multi-GPU configurations, with the Radeon Pro Duo Polaris, and for mobile platforms. Details on AMD’s Radeon Pro desktop workstation graphics cards can be found here. More information on this update and further issues can be found in the Radeon Pro Software Enterprise Edition 18.Q2 release notes. 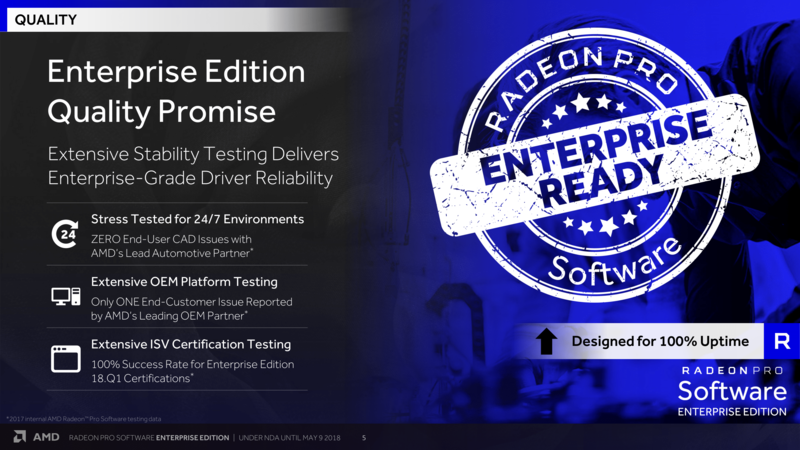 New Radeon Pro Software Enterprise Editions are released on the 2nd Wednesday of the 2nd month of the quarter. The next releases will follow on 8/8/18 (18.Q3) and 11/14/18 (18.Q4).